Russia's reputation for poor food is now, like so much else in the country, a thing of the past. In the cities it is possible to feast on anything that can be found in Western Europe, restaurants and cafes catering for all tastes and all pockets. With a vast array of international produce and dining experience, from fast food to high end, the visitor is left with an overwhelming selection. Move into the countryside and choice and quality are less guaranteed, but there's certainly no need to go hungry. It is worth noting that away from the big cities it is harder to find menus in English – so a splattering of Russian vocabulary is useful. • Kasha: a staple breakfast dish, made with milk and oats, buckwheat or semolina. • Blini: small pancakes filled with caviar, fish, melted butter or sour cream. • Ponchiki: hot sugared doughnuts. • Pirozhky: fried rolls with different fillings, usually meat. • Borscht: a beetroot soup served hot with sour cream. City centre bars are usually open until the early hours. Drinking on the street is considered perfectly acceptable. 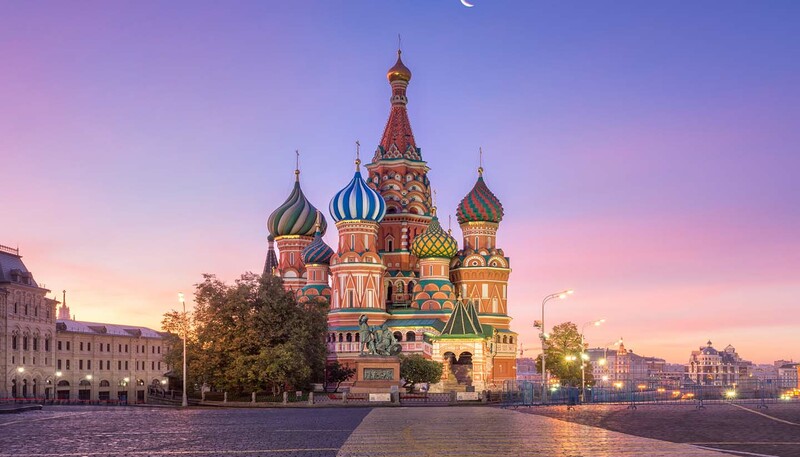 Hotels in Moscow and other large cities include a 10 to 15% service charge. Otherwise 10% is customary. No age restriction on the consumption of alcohol, but you must be 18 or over to buy it. • Chai: sweet tea served without milk. • Vodka is often flavoured and coloured with herbs and spices: Zubrovka (made with a type of grass), Ryabinovka (steeped with rowan-tree berries), Starka (a dark, smooth, aged vodka) and Pertsovka (made with hot peppers). Russky Standart, Stolichnaya and Gzhelka are also popular brands. • Krushon: cold 'punch'; champagne, brandy and summer fruits are poured into a hollowed watermelon and chilled for several hours. • Nalivka: sweet liqueur made with fruit or berries. • Nastoika: fortified wine made of herbs, leaves, flowers, fruit and roots of plants with medicinal properties.